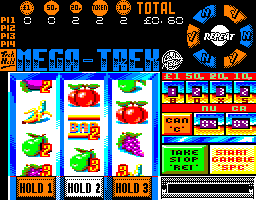 There aren't exactly many great fruit machine games about – after all, you can't win any money from them! Then again, you can't lose any, either... 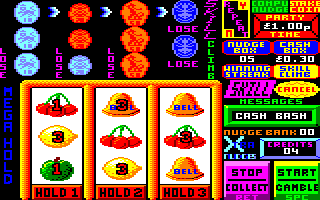 This one is crammed with extra games with enticing names such as 'Skill Climb' and 'Winning Streak', to win (or more likely, lose) some more money, and there's lots of digitised speech which you can actually make out. You can also decide to stop at any time if you think you've won enough money, which is nice. 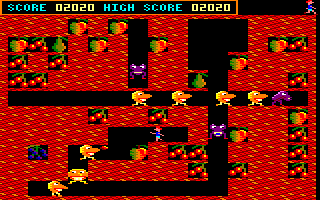 The graphics are a feast of colour and the music is seriously funky. See also: Fruit Machine Simulator 2. Watch a YouTube video of this game by: The Oliver Twins. There really is little difference between this game and its predecessor – it's just that the array of extra money-making features is so great as to be bewildering. However, there's something about the game that doesn't make it just as appealing. Perhaps it's the absence of any digitised speech, although some may consider that a good thing. Perhaps it's that the graphics aren't quite as colourful. Perhaps it's the tune, which is jolly but nowhere near as good as that in the original game. I don't know, but I prefer the original Fruit Machine Simulator to this sequel. See also: Fruit Machine Simulator. Although I never got to play this game when I was a kid, I remember reading stories in CPC magazines about how kids loved this game – and it's not hard to understand why. It's such a simple game and yet it's addictive. 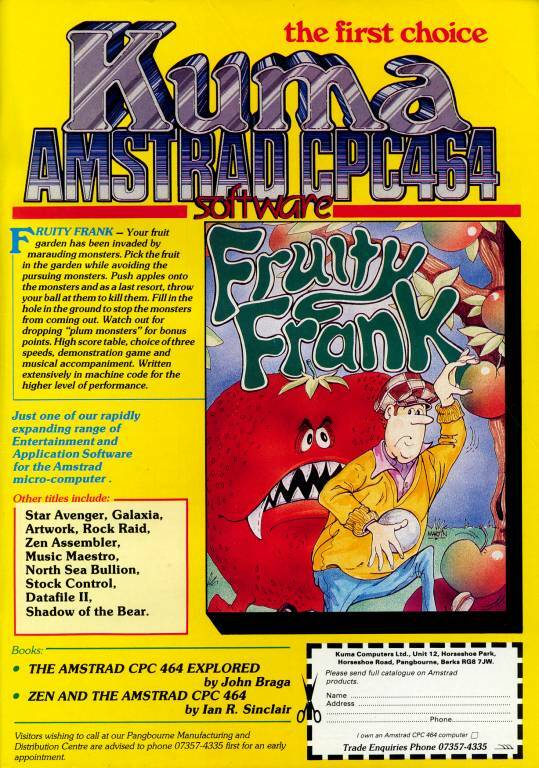 Frank has to collect all the fruit on each level, while avoiding the enemies that run around. You have to dig tunnels to reach the fruit, and you can also use apples as boulders to crush the enemies. With simple, colourful graphics and jolly tunes, this is a game that almost anyone will enjoy, no matter what age they are! Watch YouTube videos of this game by: Axelino, Xyphoe. 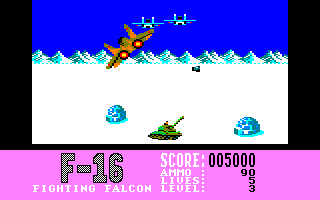 Pilot your F-16 along four missions, flying over desert, snow, the tropics and the ocean. In this offering from Mastertronic, you take on approaching aircraft, dodge tank fire and take out the helicopter bosses. 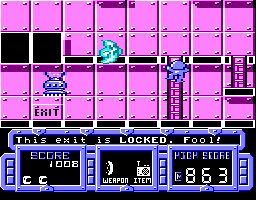 The sparse scenery passes under you at a rapid rate, as do the enemies in the sky. Each stage plays pretty much the same as the last and soon becomes tedious. The graphics are decent for such a game, with sound effects to match. A man named Xocann plans to destroy the entire Akronn planetary system. You play Jack Bludfield, a former agent of the Foundation, half human and half machine, and you must stop Xocann from carrying out his plan. Your journey starts in New York, where one of his companions still lives. 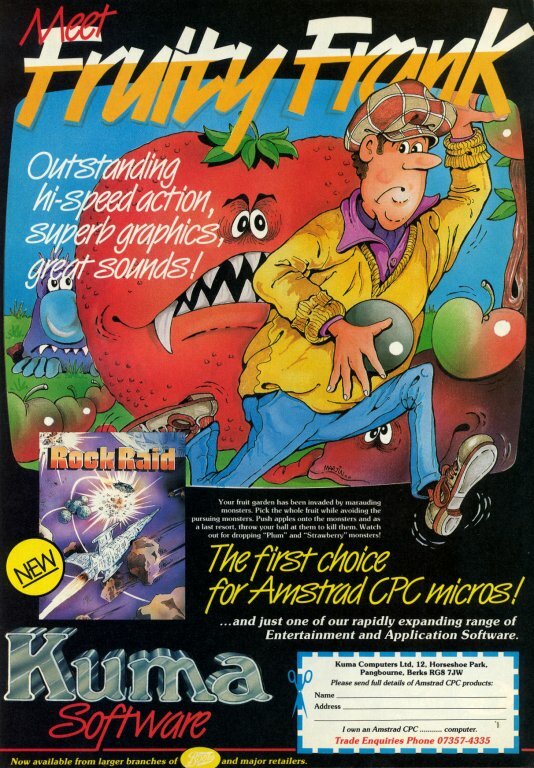 This is a graphic adventure with around 70 amazing pictures in full colour, yet using the CPC's higher resolution, four-colour MODE 1; they really have to be seen to be appreciated. In fact, there are so many pictures that the game occupies two whole discs. Unfortunately, playing the game itself is not so amazing. You execute commands by selecting icons, but it's hard to know what to do most of the time, and the unhelpful responses when you use the wrong commands – "Impossible" or "There is nothing special" – make this a somewhat frustrating adventure to play. Fu-Kung is a Chinaman who is inspecting all the casinos in Las Vegas to ensure that they are honest. Why he is doing this is a mystery... On each level, Fu-Kung must collect four playing cards, then head for the exit sign. 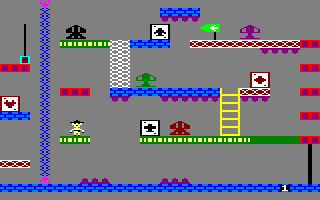 This is a very poor platform game with blocky graphics and abysmal sound effects. It's certainly not fun to play either. Fu-Kung walks very slowly, and some very precise positioning is required to jump over some of the gaps between platforms – and if you fail, you must start the level all over again. This is definitely a game you should avoid playing. Martech has a go at space racing and to be completely honest, it's at the same low standard as its other gaming ventures. It starts off with the most diabolical cursor movement I have seen on a CPC menu; you have to align a vertical and horizontal line to select the function you want. Then when the game starts, you're not sure what is really going on; you press left to go forward, and all these other cars zip past you. From what I understand, you have three race types – speed run, killing and tag – but they are chosen at random and you can't select the type of race you want to play. 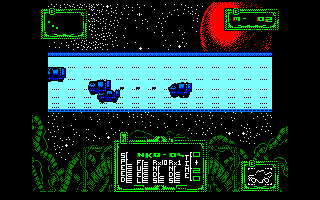 The graphics are Spectrum-looking MODE 1 and all the cars are the same colour, and the in-game sound consists mostly of a poor droning noise representing your engine. You're likely to load it, have a few goes and get annoyed and switch it off. 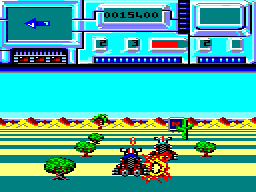 This is a shoot-'em-up which is set in a future where motorcycles are banned. But someone has developed an alternative mode of transport to replace it – the future bike. You race your future bike along five tracks, shooting other bikers and collecting money which you can use to buy power-ups to improve your bike, such as shields, smart bombs, extra energy and lives, and a radar to show the route the track takes ahead of you. The radar is very useful because the game is remarkably fast, and if you crash into the side of the track (which is easy to do), you lose a lot of energy. The graphics are reasonably good, but it's a standard shoot-'em-up, and the speed of the game will put a few people off. Watch a YouTube video of this game by: Axelino. 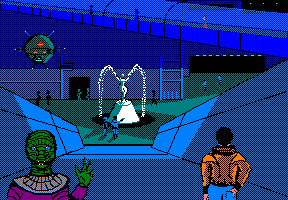 In this game from Tynesoft, you play a very happy-looking chap in a strange world indeed. Collecting items is the task at hand as you wander around this very weird place. Certain areas allow you to levitate, while others take control of you, throwing you to some hidden room. Each room is decorated with some very crude-looking platforms and oddly chosen colours. The sprites are all blocky and flickery, adding to the poor game that this one is. As you listen to the pleasant tune (which can be turned off in the tabs above the play area) something springs to mind here – weird game!